G’day and welcome to Partakers and to our series, HAHA – Heroes and Heretics Abound. Together we are looking at the story of the church from its origins through to the Age of Reasoning in the 18th century. Last time we looked at the Renaissance and some of the great names of Church History – Savonarola, Colet, Erasmus and a’Kempis! You may remember that in our series we looked briefly a the split between the Eastern and Western churches. Today we come to a greater split! A split within the Roman Catholic church – the beginnings of the Protestant church! . The main person who will look at today is Martin Luther – one of the very giants of church history! . Martin Luther (1483-1546) - Professor of Biblical Studies at Wittenburg University in Germany. Luther tried to find god as an Augustinian monk but he was unable to come to terms with God's righteous demands. He eventually realised that in order to satisfy God’s righteous demands, that he could do nothing of his own to fulfil them. He came to see that justification before Almighty God was by faith alone, through grace alone, which was a gift of God. Included in the aftermath of this discovery, were these events! . 95 Theses - statements against indulgences nailed to the castle church door at Wittenburg on 31st October 1517. He rapidly gained a following in Germany, and was aided by the printing press. 1519 - denied the supremacy and infallibility of the Pope and Church. 1521 - Diet of Worms. Luther was outlawed by Emperor Charles V of Spain. He was hidden by friends for 8 months, during which he translated the N.T. into German. 1528 - Diet of Spruger. Each German state allowed to follow the religion of its reigning prince. 1529 - Diet of Speyer. Lutheran states to remain Lutheran and Catholic states to remain Catholic, not allowed to change. Evangelical princes protested at restriction and the Protestant was given to this movement. 1530 - Diet of Augsburg. Protestants submitted statement of belief witch was rejected, but became the basis of Lutheran doctrine. 1547 - War broke out between Catholic and Protestant. This war was won by the Catholics, but Protestantism was finally recognised legally in 1552. Three main truths to come out of the Reformation. Final authority of God's Word. Justification by faith, a gift of God's grace. The priesthood of all believers. .
Consubstantiation - a 'real presence' of Christ's body with bread and wine. .
Lutheranism quickly spread from Germany to Denmark, Norway and Sweden. .
That’s it for this time! Next time in our series HAHA, we will continue looking at the great Reformers of the church! Thanks for listening! Come back to Partakers, where every day there is something new to encourage your walk as a Christian in the 21st century. 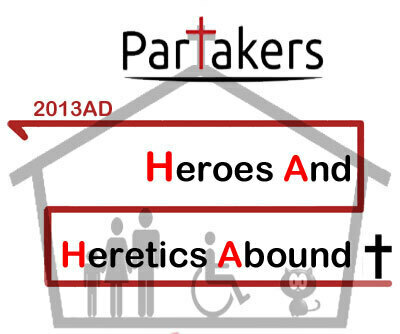 G’day and welcome to Partakers and to our series, HAHA – Heroes and Heretics Abound. Together we are looking at the story of the church from its origins through to the Age of Reasoning in the 18th century. Last time we started looking at the growing unrest within the Roman Catholic as steps toward Reformation gather apace. Today we see the influence of the Church wane amidst both religious and societal turmoil and a brief look at two men rising in opposition to the Church. We are now in the 14th & 15th Century! The church has grown exponentially from the original 12 apostles of Jesus Christ. It has spread far and wide in the known world. However, this period in history shows that the Church is now declining rapidly – both numerically and in its influence. We look briefly today at the reasons for this. Firstly we look at that Agivnon Popes or as some term it “Babylonian Captivity of the Papacy.” Pressure from the French monarchy in conflict with the Papacy, caused the Papacy to move to Avignon, France from Rome in Italy. This was due to the elected Pope, Clement V refusing to move to Rome and remained in France, finally moving the whole of his court to Avignon in 1309. From here there were 7 successive Popes, elected by the French rather than Italians as before. Now we have the ‘Great Schism’ or the ‘Western Schism’ occurred with the Catholic Church from 1378 to 1417. The Pope returned to Rome from France in 1377, after a riot in Rome to ensure that the next Pope was Italian in 1378. The French then elected a Pope of their own. There was much disputation and at one stage there were 3 Popes - the Avignon Pope: Benedict XIII; the Roman Pope: Gregory XII; the Pisa Pope: John XXIII. A Council was called by the Pisa Pope John XXIII in 1414 and agreement was reached as to the procedure of the election of a new Pope. All these events though caused a great loss of confidence in the Church. Wealth, corruption, immorality and the scandalous indulgences were rife throughout the Church, which led to much discontent and uncertainty. In the year 1453, Turkish Muslims attacked the Eastern Empire and the great Christian city of Constantinople fell. Bubonic Plague broke out in 1347 and killed one third of the Catholic west in 3 years. The Rise of national consciousness and strong monarchies developed in England, France & Spain resisting pressure from Rome. d. Rise in Personal Devotion. There was in Northern Europe a growing movement around personal devotion to God, and therefore less reliance on the Church for spiritual insight. But more about that next week! It was also an area of global exploration with the likes of exploring greats of Magellan and Columbus. There was also growing criticism of the church, particularly from within! John Wycliffe (1320-1384) - Wycliffe was a Priest in the Roman Catholic Church and a leading philosopher at Oxford University. He spoke out against church corruption, transubstantiation, confession to the priest and infallibility of the church & Pope. Many travelling bands of teachers and preachers were organised and sent out by him. To get a hint of the disturbance to the Church caused by Wyclif, here are some of the things he said. It is plain to me that our prelates in granting indulgences do commonly blaspheme the wisdom of God. Our clerics neither evangelize like the apostles, nor go to war like the secular lords, nor toil like labourers. The bread while becoming by virtue of Christ’s words the body of Christ does not cease to be bread. The gospel alone is sufficient to rule the lives of Christians everywhere. Any additional rules made to govern men’s conduct added nothing to the perfection already found in the Gospel of Jesus Christ. Jan Hus (1374-1415) - The other main critic was the Bohemian man, Jan Hus. Hus was a priest in the Catholic Church and Rector of Prague University. Hus was strongly influenced by Wycliffe, and much to the chagrin of the Catholic Church hierarchy, he promoted personal devotion and piety; the supreme authority of the Bible; taught that the Church is the body of Christ and the head is Jesus Christ - not the Pope; and that only God can forgive sin, not the Church. Again, Hus was another man ahead of his time and one of the pioneers of the protestant church to come. Hus, because of his condemnation of much Church teaching and practise was imprisoned, tried, condemned and executed in 1415 following the Council of Constance. "Has not God himself instituted marriage, as a means to satisfy the craving for love in all men. ... For those are speaking lies in hypocrisy, who have a seared conscience, who forbid a life in marriage and abstain from foods which God has created (1 Timothy 4:1-5). I hold this to be the seed of iniquity and the root of all evil." That’s it for this time! Next time in our series HAHA, we will look at the birth of the Renaissance. Thanks for listening! Come back to Partakers, where every day there is something new to encourage your walk as a Christian in the 21st century. G’day and welcome to Partakers and to our series, HAHA – Heroes and Heretics Abound. Together we are looking at the story of the church from its origins through to the Age of Reasoning in the 18th century. Last time we looked at at the papacy at the height of its power… Today we look briefly at a monastic revival in the Middle Ages! As we saw last time, under the leadership of Hildebrande and Innocent III, there was a revival of monastic orders. Let us look briefly at some of the prime people from this period of our Church History. This order of monks was founded in 1097 in France, the village we know now as Cîteaux, by a group of Benedictine Monks including Robert of Molesme, Alberic of Citeaux and Stephen Harding. The Cistericans are also known as the White Monks due to the colour of their clothing over which a black head-dress is worn. The Cistercians lifestyle emphasizes a manual labour rather than scholarship, an ascetic lifestyle and self-sufficiency. Many Cistercian abbeys supported themselves through brewing ales and from agriculture. One man who helped them spread rapidly throughout Europe was the next person we will learn about – Bernard of Clairvaux, who entered the monastery in the early 1100s with 30 companions. He was one of the most influential leaders and stressed a devotional relationship with God, and led many men into a monastic lifestyle. By the end of the 12th century, wealth & laxity had crept into the monastic movement and as a result, declined rapidly. However, the preaching monks soon became more important. These monks lived together under a strict rule, but went into the community to teach and preach. Friars were the most important preaching monks. The founder of the Franciscans was probably the man who is one of the most known monks of all. Francis was born the son of a wealthy Italian cloth merchant Pietro di Bernardone. During his early adulthood, Francis lived a typical life of most young and wealthy men, and even fought as a soldier. He had a vision when at war in 1204, which directed him back to Assisi. Here he lost his taste for his wealth and worldly life. Francis gave away his possessions to live a simple lifestyle, begging and giving to the poor and caring for the sick. He gained many followers and was given his official status by Pope Gregory IX, when on July 16, 1228, he was pronounced a saint. Francis’ lifestyle and teaching stressed simplicity, poverty, genuine devotion to God, preaching and charity. (Black Friars, founded 1220). This order of Monks was founded by a Spanish priest, Dominic de Guzman. While he made his headquarters in Rome, he did travel widely to visit the growing brotherhood of friars under the Dominican movement. They were renowned for the fact that they owned no property and had no revenues – simply trusting in God to provide. He emphasised the Friars role of teaching and they rapidly spread throughout the lands. They quickly became known as the "Watchdogs of the Lord", and were renowned for hunting down heretics. That’s it for this time! Next time in our series HAHA, we will continue to look at the Church in the Middle Ages – looking at such luminaries in the Church such as Anselm, Thomas Beckett and Thomas Aquinas – who helped form much of what we believe as Christians today. Thanks for listening! Come back to Partakers, where every day there is something new to encourage your walk as a Christian in the 21st century.